Edited by the father of endourology, Arthur Smith, Smith’s Textbook of Endourology is the definitive reference book in the field, addressing every aspect of endourologic procedure including methods of access, operative techniques, complications, and postoperative care.The reader is taken on a step-by-step journey through percutaneous surgery, ureteroscopy, extracorporeal shock wave lithotripsy, laparoscopy, and lower urinary tract procedures, and is given a comprehensive look at the influx of and dynamic changes in robotic and laparascopic procedures, and image-guided technologies. The principles and function of state-of-the-art endourologic instruments are outlined for each procedure. Now in full-color, the third edition contains 800 extra pages, culminating in an 1800 page, two-volume textbook reflecting the most current advances in endourology. A supplemental DVD includes over 100 high-quality surgical videos allowing you to see endourology in practice. 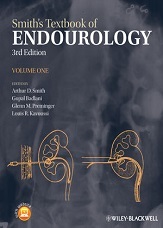 With all chapters thoroughly revised by world-renowned authors with unrivalled expertise in the field, Smith’s Textbook of Endourology 3E is an essential reference book for all urologists, particularly those who regularly perform endourology in their daily practice. This new edition, with its vast amount of extra content, will rightly cement its status as the leading urologic surgery textbook.